Has a bold fruity flavour ideal for cooking and baking. Use it like vanilla in baking, or any application in which you would use soy, teriaki or hoisin sauces. A little goes a long way. 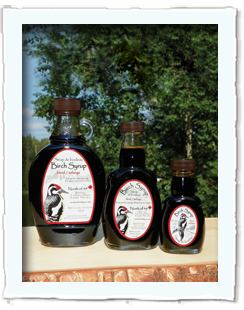 Has been blended with organic cane sugar to provide a sweeter syrup. Versatile, it may be used in cooking and baking or especially good as a topper on vanilla ice cream, your morning oatmeal, glazed carrots...the possibilities are endless! 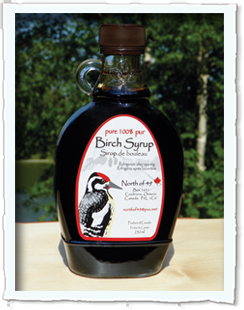 75% pure maple syrup & 25% pure birch syrup combines the best of both worlds. 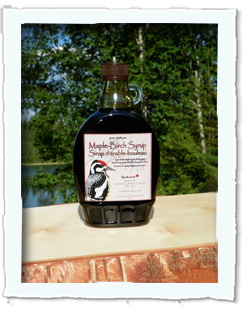 This sweet syrup is made for pancakes & french toast.